Tom Yum Soup: A Flavorful Broth for Spring | Mealtime | Kids VT - small people, big ideas! The onset of spring in Vermont is unpredictable. After experiencing a few warm days in February, I usually start to get hopeful that winter is coming to an end. But March is a mixed bag, with both late-season snow and tantalizingly sunny days. By the time April comes along, I am more than ready for light cotton sweaters and bike riding. While we patiently wait for consistently milder weather, why not fill our bellies with a beautiful, light Thai soup, full of bright flavors to match the coming season? A lot of people think of delicious dishes like Pad Thai and Drunken Noodles when they think of Thai food. But, for me, the combination of flavors in Tom Yum makes it a standout. A melodious blend of lemongrass, kaffir lime leaves (which have a distinctive sour smell, not at all like the sharp scent of lime zest), and galangal (a relative of ginger) makes the broth sing. Hot, sour and bright in flavor, this soup is highly customizable. 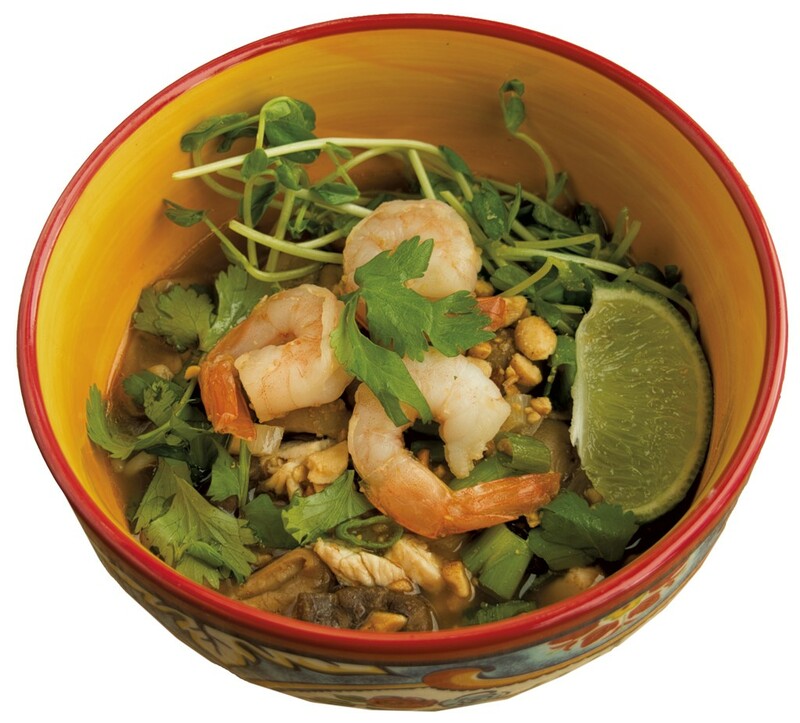 When I served it, I put out bowls of ingredients — minced chicken, green onions, cilantro, bean sprouts, rice noodles, peanuts and shrimp — for my dinner guests to choose from for their bowls before spooning the mushroom-laden broth on top. It was a fun approach, and it allowed those who weren't fans of cilantro to opt out of the divisive herb. The hardest part of making this soup is probably gathering all the ingredients. A good Asian market should have everything you need — plus, it's fun to explore the unusual products that line the aisles. I found the kaffir lime leaves, lemongrass, chili paste and oil, galangal, and noodles at Thai Phat on North Street in Burlington, though I had to ask for help to locate a few of them. (The galangal and kaffir lime leaves were in the freezer; I never would have thought to look for them there!) It's worth going out of your way to find these ingredients, especially the kaffir lime leaves, because they add a wonderful and unique flavor that's the heart of this dish. I kept the spice level on the milder side so that it would be family-friendly, but you can add more chili paste or chili oil if you like it hot. Combine all the ingredients for the broth, except for the mushrooms and half of the shallots, in a large soup pot and add the chicken breast. Bring to a boil, then simmer for about 20 minutes, or until the chicken breast is cooked through. Remove the chicken and mince. Set aside for the finished soup. Carefully strain the broth into another large pot using a sieve or colander to make a clear broth. (Eating pieces of lemongrass is not a pleasant experience!) Cook the rice noodles in the broth according to package directions, making sure they don't get too soft. Remove the noodles with cooking tongs, put them in a bowl and toss in just a little chili or vegetable oil to keep them from sticking together. Set aside until ready to serve. Add the reserved shallots to the broth and simmer for about five minutes, then add the canned mushrooms and cook for an additional five minutes. Season with chili paste and oil to taste. If using frozen, precooked shrimp, thaw them in the broth until warmed through. 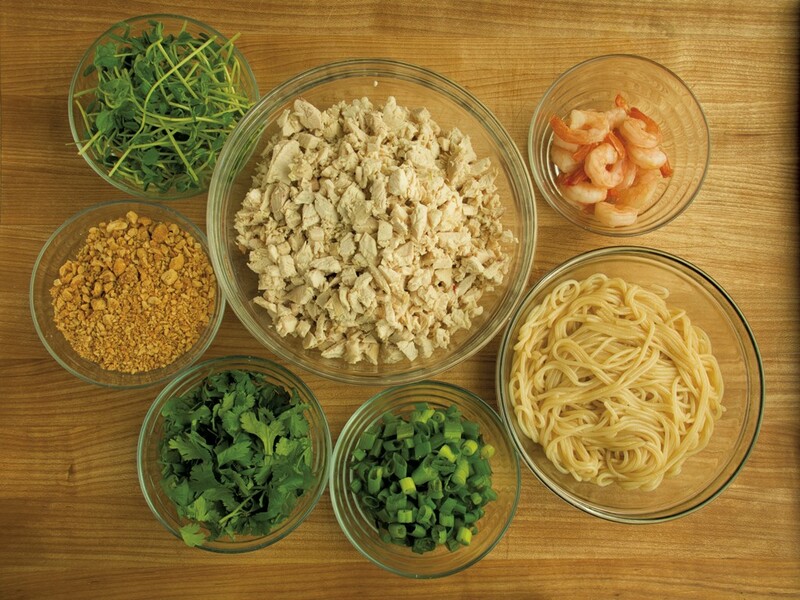 Serve the soup by putting desired items — including chicken, noodles, green onion, cilantro, pea shoots, sprouts — in your bowl, then spooning broth over the top. Sprinkle with chopped peanuts, and finish with extra chili oil and a wedge of lime, if desired. Enjoy in any season.